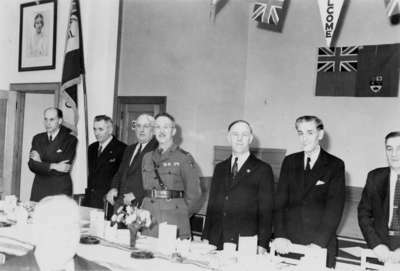 A black and white photograph of the head table guests at the first Remembrance Day dinner in the new Whitby Legion Hall. From left to right are: Peter Draimin; Frank Threadgold; Robert M. Deverell (Mayor); Reverend Captain E. Ralph Adye; Tom Semple; Reverend David Marshall (Legion Chaplain). The Legion Hall was built in 1944-1945 on the east side of Byron Street between Dundas Street and Colborne Street. In 1949-1950 an addition was built on the north side of the hall. Remembrance Day banquet in Legion Hall, 1945, Photographer Unknown. Whitby Archives 29-004-034.